July 4, 1933. "New York City. 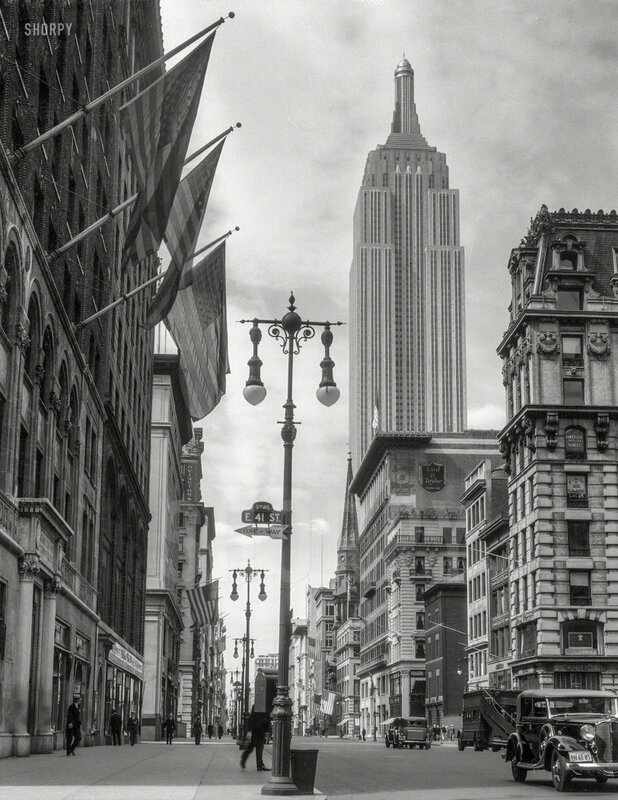 Empire State Building from 41st Street and Fifth Avenue." 4x5 nitrate negative by Theodor Horydczak. View full size. Submitted by CarolMcC on Fri, 11/13/2015 - 3:23pm. In each photo of this time period I'm struck with the care and detail used in making the streetlights. I think they were magnificent. Submitted by Phare Pleigh on Fri, 11/13/2015 - 10:10am. It is interesting to see the young building in its early surroundings. 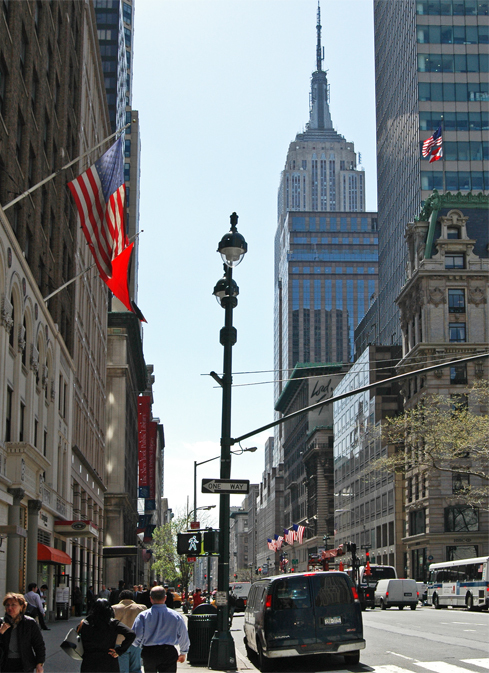 While today it is still prominent from a distance, here we can see its dramatic profile from the street when its only rival was the slightly-older Chrysler Building. Submitted by Chrome58 on Fri, 11/13/2015 - 3:41am. It's the first time I see the original top of that skyscraper. It's a beautiful example of art deco architecture, and it's too bad it's been overwhelmed by antennas as time went by. It was truly a splendid skyscraper in the New York skyline at the time, an architectural success. Submitted by A Californian on Fri, 11/13/2015 - 12:03am. It's a 1933 Buick Convertible Sedan and was expensive then and would be incredibly more so now. My grandfather said that lots of physicians bought Buicks during those years because the cars didn't make their owners appear they were flaunting their wealth, but also indicated that their patients lived at least long enough to pay their medical bills. Submitted by TimeAndAgainPhoto on Thu, 11/12/2015 - 7:38pm. Submitted by Solo on Thu, 11/12/2015 - 4:56pm.